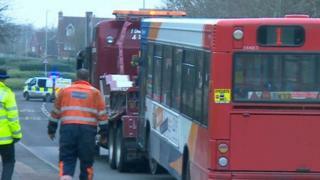 A 10-year-old boy is in a serious condition in hospital after he was hit by a bus in Kent. The collision happened at about 09:15 GMT on Singleton Hill in Ashford, police said. The boy was treated by paramedics at the scene before being flown to a London hospital for further medical attention. His condition has been described as serious but stable. Police are appealing for witnesses.